"Watanabe no Tsuna was one of the four legendary retainers of Minamoto Yorimitsu. Among the stories of his famous deeds is one about meeting a demon. One version says this happened on the roof of a house near Modori-bridge at Ichijō, the other mentions Rashō-gate in Kyōto as the meeting place. The first is the one represented here. Tsuna went to the spot as he was challenged by some friends. He decided to show them his courage and one night in the year 976, in bad weather, he waited for the demon who was thought to haunt there. He placed a notice board with the characters 'Kinzei' (prohibited) as a warning and after several hours of being on his guard he all of a sudden felt a tug at his armour and with his sword he swiftly lashed out at a creature in the dark. He succeeded in cutting off his assailant's huge and hairy arm, whereupon the demon fled with a horrible squeal. Tsuna kept the arm as a souvenir in a box, but a few months later the demon, disguised as Tsuna's old nurse, managed to take the box from the retainer. Kunisada translated the 'bad weather at night' into broad, somewhat curved black strokes, creating an effect of movement all over the two sheets and at the same time turning the two panels into a whole. At the bottom right is the top of a tree, reaching slightly higher than the ridge of the building upon which the confrontation takes place. Tsuna's face, turned towards the spectator, has a furious expression, while that of the demon looks both grim and surprised." Quoted from: What About Kunisada? by Jan van Doesburg, p. 32. Van Doesburg adds that this early work by Kunisada shows the clear influence of Katsukawa Shuntei. 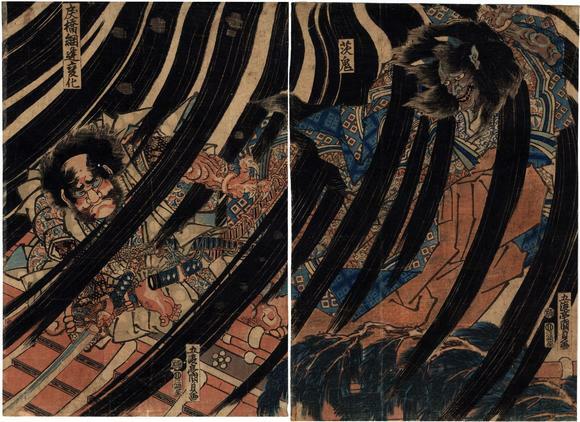 There is a small black and while illustration of this diptych in Japanese Warrior Prints 1646-1905 by James King and Yuriko Iwakiri, p. 187.